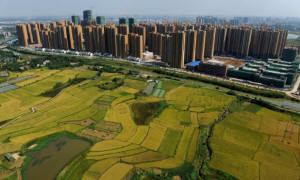 An hour’s drive south of central Beijing, the city’s squat mid-rise buildings fan out into fields. Ramshackle brick houses stretch on for miles, coal and cabbage piled high by their doorsteps, while sheep graze by the roads. This tiny village called Nanzhuang — about 30 miles south of the Forbidden City — is in for a change. Before long, the government will destroyit and about 10 surrounding villages to build one of the world’s largest airports.